The Austin Hughes N series 1U Next Generation LCD Key drawer is available with a 17" or 19" SAMSUNG Class A LCD panel, the rack mount drawer ships as standard with both PS/2 and USB (Combo) connectivity and with either touchpad or trackball in most European keyboard language layouts. The drawer is an enhanced version of the highly popular RKP series with improved aesthetics, a new front panel, single or one man installation rails and a new keyboard with standard numerical pad and the mouse module to the lower centre of the keyboard. 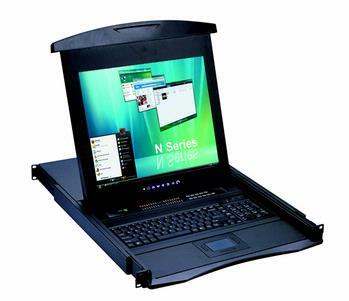 By selecting the optional integrated USB, PS/2 or Cat5 KVM switch the KVM drawer allows you to connect up to 8,16 or 32 servers (Cat5), in addition to this the KVM drawer can be cascaded 'or stacked' with other AH LCD drawer series of rackmount KVM switches to enable access to up to 128 servers. Austin Hughes N series further offers high density integrated 16 and 32 port Cat5 KVM switches, designed to provide added benefits to its users the new switch range offers increased density, increased distances (40m) between the switch and server, enhanced cable management and multiplatform capabilities over traditional KVM switch platforms. Using either a PS/2 or USB dongle at the server end of the installation allows a user to cost effectively specify the switch to match the exact server configurations – multiplatform switches allow older or redundant servers to be migrated to servers with newer USB interfaces without replacing switch hardware. A second user can work securely via a remote keyboard, monitor and mouse either across a Cat5 cable link of 300m within the building or across the World Wide Web using 128 bit secure IP access. This plug and play technology requires no software to be installed on the servers or remote PC’s but provides seamless secure access either over Cat5 cable or via IP and a web browser. Secure IP access allows the ultimate server control even to Bios level of your infrastructure.